Notice from SPD Public Affairs on July 14, 2016 2:26 pm. Original post here. Today the Seattle Police Department launched its new Micro Community Policing Plans (MCPP) site. 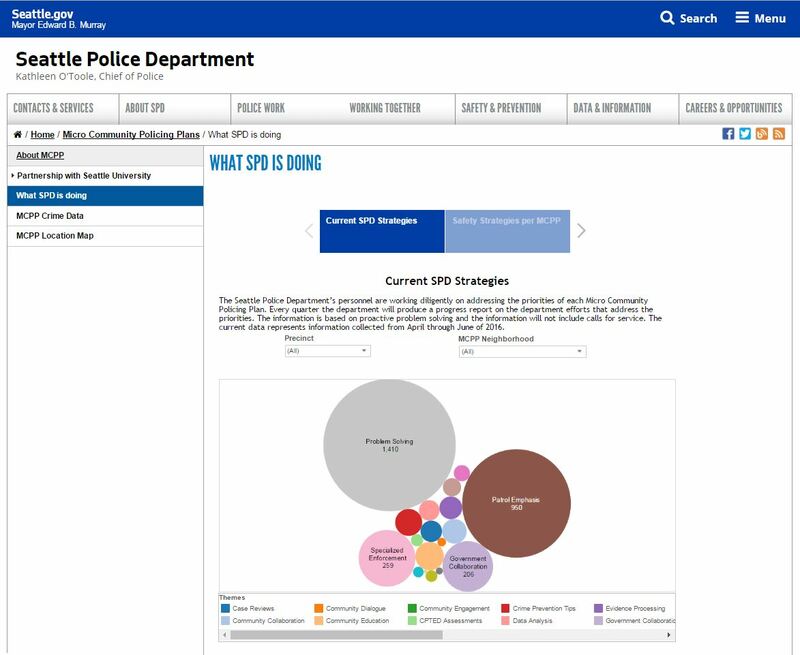 The updated site features crime data, interactive dashboards, and strategies deployed by SPD to address priorities identified by the city’s 58 MCPP neighborhoods. MCPP are the result of grassroots efforts, with direct collaboration from residents, business leaders, stakeholders, and police officers on the beat. Under the MCPP, community residents work in partnership with their local precinct captain and Community Policing Team to identify problems, analyze existing quality of life and crime data, and design individualized plans to reduce and prevent crime. The department first unveiled its MCPP strategy in April 2015. As part of the MCPP, SPD partnered with Seattle University to administer a first of its kind, micro community level survey to gain a better understanding of how safe people feel in their communities and what influences their safety perceptions. The non-probability survey was administered both online and on paper from October 15 to November 30, 2015 in seven different languages and garnered 7,286 responses, collecting data from citizens at city, precinct, and micro-community levels. Outreach also included capturing survey responses from individuals who were unlikely to respond to an online survey. The survey gauged attitudes around public safety issues, perceptions of police, neighborhoods, and crime. Quantitative responses were weighted based on gender and race/ethnicity to better reflect the Seattle population. Survey findings are based on this snapshot in time and are built into the new MCPP website. Across Seattle’s neighborhoods and the city as a whole, respondents indicated that Seattle maintains high levels of social organization, social cohesion, and informal social controls. In the face of vital national and local conversations about the nature of policing, the survey revealed a strong level of trust in SPD and its officers. Together these factors create an environment that is ripe for residents and their police department to jointly identify and solve existing concerns. The survey also confirmed what law enforcement and residents of Seattle and all of Washington know – property crime is too prevalent. The groundbreaking micro-community input this work provided helps differentiate those communities where property crime is the central concern and those where it joins many others – drugs, homelessness, and public disorder – as symptoms of systemic issues that require the communal strength the survey identified to resolve. 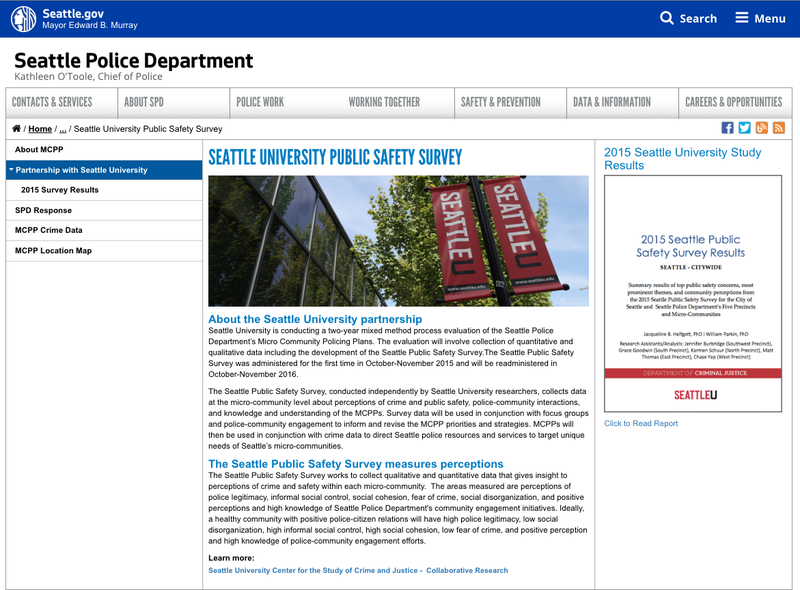 The Public Safety Survey is part of Seattle University’s two year independent and objective evaluation of the MCPP, and adheres to research ethics approved by Seattle University Institutional Review Board. 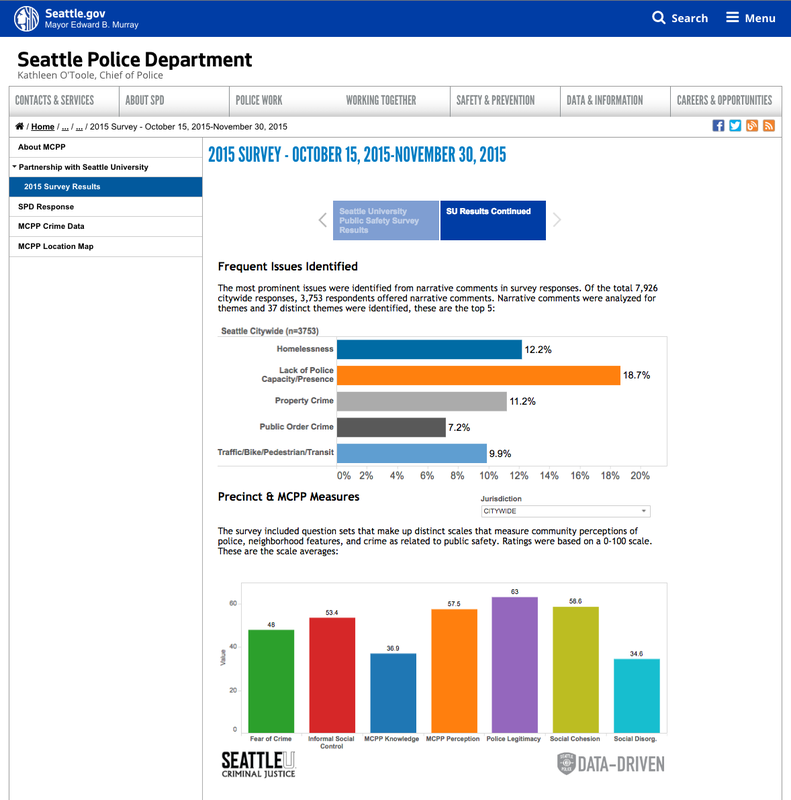 SPD will continue to update existing MCPP based on community group feedback, current and ongoing survey results, and analysis of crime trends. The information collected from the survey was broken down into each of the 57 (currently 58) micro communities and is being used in conjunction with official crime data to give a holistic view of the MCPP, and provides a benchmark for this initiative going forward. The survey will be administered on an ongoing basis — the next opportunity for the community to participate will be from October 15 to November 30, 2016. Community members are highly encouraged to continue voicing their areas of concern, with the end goal of having real-time data collection to inform the MCPP, thereby improving police services. SPD is the only police department in the country doing work at the micro level. The MCPP is a focal point to addressing the needs of each and every community it serves.